Daydreams of Quilts: My 40th Birthday Giveaway! 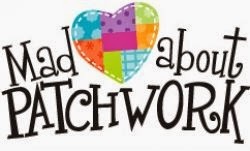 The prize is a $50 gift card to Mad About Patchwork a Canadian online and brick & mortar shop. They have been super nice to me and I want to thank them and also support shops in my country. :) To enter, please use the Rafflecopter below. If you are not on Facebook you can sign in with your email address. New followers are welcome to enter and these giveaways are open to anyone worldwide. The giveaway will close on July 2, 2014 at 5:00 p.m. Mountain Time.